Sorry for the delay in service. Been so busy of late, but still not much to report. So I'll start with last weekend and the RSPB's Big Garden Watch and no, it's not about looking at, or for big gardens. No, you sit for one hour looking into your garden/park or other place of wilderness and count what birds you see, simples. I had much planned for the weekend and I decided to do my hour's stint on sunday afternoon. So lets get Saturday out of the way first. Saturday saw me in Holywells Park in Ipswich after a friend of mine had been boasting of his spotting triumphs where in the last week he had spotted a Little Egret, Kingfisher, Mandarin duck and an escaped Harris Hawk still wearing it's anklets. Thankfully, the jesses (the removable leather straps that attach to the anklets that allow the falconer to hold onto the bird) have been removed, otherwise the bird could get caught up in a tree or something and die a horrible death. Apparently, it's been on the loose for a couple of months now, so it is obviously doing well feeding off the local wildlife which isn't good the the local wildlife. This sort of thing can upset a local ecosystem as it is an introduction of an alien species that in itself has no predators and the poor wildlife are not expecting to be attacked by a large-ish raptor. As can be seen by the National Biodiversity Network's Gateway records for Harris Hawk, they are becoming quite widespread. Each red dot represents a 10km square where they've been spotted. So armed with binoculars, me and the wifey went off for a wander around the park to see what we could find. T'was a sunny, yet very cold day over the park and my intention was to seek these species that my good friend had spotted to add to the list. A wander round the ponds in the hope of spotting a Little Egret or Kingfisher was my main plan with an eye looking up for the Harris Hawk. All the usual suspects already spotted were milling about being fed by eager children practicing their bread throwing skills. 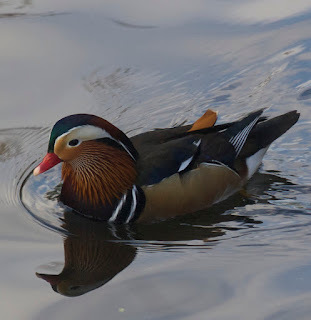 So we went over to some of the less visited ponds and I immediately spotted a Mandarin Duck, another non-native species that was introduced in the last century. Male Mandarin spotted at Holywells Park, Ipswich. I remember when I first saw this amazingly coloured bird many years ago on the Norfolk Broads. I thought I was seeing things, it almost looked like someone had drawn and coloured this bird. Unfortunately, this photo has been heavily cropped and really doesn't do the bird's plumage justice, but take my word for it, they are a beautiful bird. Then I saw another bird with fantastic plumage, the Kingfisher. With its iridescent blue back and bright orange front it would be hard to disagree. But the best thing about this bird is that it's a native species that can be found worldwide. So coupled with the Mandarin and the Teal (spotted on Friday) the Kingfisher comes in at number 65. I know, still trailing. So as you can see, although there was quite a variety of bird life in my garden, there was nothing that I hadn't already spotted this year. The rest of the week was pretty fruitless too, with me only being able to add one other species, an Eider duck. Day 36 is now here and on 66 species, that puts me 42 species behind schedule and the gap is ever increasing. Especially as about 6-8" of snow fell last night, the spotting is getting to be even harder. Roll on spring!